Renee serves the South Jersey area. I frequently train in Cherry Hill, Haddonfield, Hammonton, Williamstown, Medford, Deptford, Woodbury, Voorhees, Marlton, Mt. Laurel, Moorestown, Palmyra, Collingswood, Sewell, Mullica Hill, Tabernacle – just to mention a few. Is Your Dog Always in the Doghouse? Does he jump up on people? Does he chew your shoes and steal your undies? Does he have “selective hearing” Guess what? Your dog is behaving just like … a dog! He doesn’t know he’s doing anything wrong. It’s up to you to teach him what behaviors you want him to do, rather than just inadvertently reinforcing him to do behaviors that are working for him everyday. So, how can we make those changes happen? Train Your Dog to Do What You Want Him to Do! 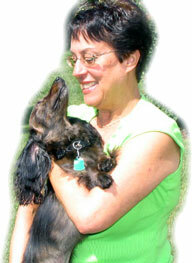 Hi, I’m the Jersey Dog Trainer Renee Premaza, and I train dogs using force-free methods! I would love the opportunity to teach you how to effectively train your dog to pay attention and to want to learn appropriate behaviors both in your home and out in public. By motivating your dog with reward-based methods, you will create a wonderful relationship with your companion dog based on trust and good communications. When you reward good behaviors, those behaviors increase. When people punish their dogs or use harsh methods of training, relationships deteriorate. If your dog is barking excessively, chewing on furniture, or digging up your garden, you and I can teach him more appropriate behaviors to choose. If we punish him by jerking on his collar, hollering or hitting him he will only learn to choose avoidance behaviors. We don’t want our dogs to be afraid of us! There is no quick fix for serious behavior problems! You must take the time to train and you must be patient, consistent and understanding of your dog’s needs. I am vehemently opposed to the indiscriminate use of shock collars! You would never hear the Veterinary Behaviorists at the University of Pennsylvania advise anyone to use these collars. You certainly wouldn’t hear any responsible trainer or veterinarian tell you to shock your dog to teach him how to behave appropriately. Please understand that the basics of any good training program requires that your dog trust you. You want to prevent your dog from associating you with pain and discomfort. A good trainer understands the scientific Laws of Learning. Anytime I’ve been asked to work with a dog that has been harshly trained or shocked, I have found them to be very slow and hesitant to learn new behaviors. The answer for this apparent slowness is not stupidity! The dogs are clearly afraid to make any mistake for fear of having to experience more punishment and inappropriate handling! Dogs that are handled and trained with positive methods are eager to learn, and to volunteer desirable behaviors so they can get rewarded. They’re happy dogs, not stressed out, anxious and neurotic animals! The so-called “trainers” who use this device (aka “remote collar ” or “e-collar”) are depending on the use of an electronic piece of equipment to do their job for them rather than using creative skills and talent to teach dogs. Don’t let someone convince you that you’re only going to use the collar to get your dog’s attention. If your dog sees you as being a valuable and trustworthy guide in his life, he will pay attention to you. Dog training should not be a shocking experience! If you hire a trainer and your gut feeling tells you something doesn’t feel quite right about how they’re treating your dog, listen to your gut feelings! Don’t allow anyone to cause physical pain to your dog! Physical pain results in emotional distress! Don’t hesitate to instruct this person to stop handling your dog immediately. You would never allow a person to cause physical harm to your children or other family members, right? Your dog is a member of your family. Let him know you will always keep him out of harm’s way. Think “red flag” if someone says, “I can train your dog in only one visit.” Training doesn’t happen overnight. No animal or human can learn everything they need to know in one session! Whenever I’ve attended outdoor functions, like shelter fund raisers, I watch the shock trainers stroll around the grounds with their German Shepherds who walk offleash in heel position. I’ve observed that the dogs look very dull, they have no facial expressions, their heads are held low, they don’t appear to be unhappy and they don’t appear to be happy. The seem almost robotic, not like a normal, happy, playful, fun loving companion pet. 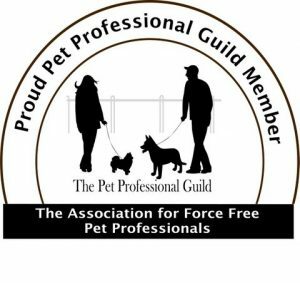 Listen to one of my radio broadcasts that discusses the use of shock collars and electronic invisible fences. 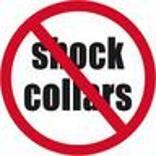 Click on the page marked “Renee’s Radio Show.” Scroll down to one of my earliest shows that mention shock collars. It’s a 30 minute talk about the ramifications of using electronic equipment on our dogs. Dogs need rules and structure in their lives. I can help you implement programs in your training and in your dog’s daily life so that he knows what is expected of him. Together, we can teach your dog to be polite and mannerly. We can teach him that he needs to get permission to get his meals or toys or special attention from you instead of demanding these things by pawing at you, or barking in your face or jumping on you or your family members. Believe it or not, spoiled dogs are not happy dogs. Dogs that have no structure and know no boundaries in their lives are also not happy — they’re stressed and anxious. Dogs who are unhappy develop behavioral problems. For example, they can become unruly and out-of-control, they can become destructive of your home and possessions. Dogs can develop housetraining problems, even after they’ve had a good history of not soiling inside. Unhappy dogs very often develop neurotic behaviors, such as tail-chasing, fly-snapping, barking uncontrollably, biting and self-injurious behaviors. Their health can also suffer. If you see that these problems have developed in your dog, know that s/he is begging for help. Treat Your Dog Like a Human and He'll Treat You Like a Dog!